Bus fleet branding design and application specifics to bus model "Orion V". I designed this logo and font to go along with it. When I designed it, I made a list of words that would go with Public Transit, and what I wanted this new brand to reflect. The logo was the first part of the redesign as part of the branding the company wanted to undergo. I researched fonts, curves, sizes, potential uses, even the way the bus would look when driving through the service area. I finally decided that a custom font was necessary and would pull this public service ahead of larger agencies, and would be highly visible within the service area it covered. Part of this branding covered marketing the new look to current service areas as well as to potential users. Both who I wanted to experience this new look as a new positive experience to what they were accustomed to. As a Marketing and Public Relations Coordinator for this pubic transit agency. I was deeply involved not only as of a designer, but also as the PR and Marketing Go-To. I coordinated marketing efforts through advertising and public outreach (while serving in city wide and state government boards). I promoted and advocating the use of Public Transit, bike use and Para-transit, and all marketing campaigns whether it was television, newspaper, print and radio ads campaigns. I made adjustments and decisions on the use of budget and compliance with the annual marketing plan. Redesigned printed maps that were originally larger than 11x17" and included confusing folds, to a pocketable 4"x6" double coated cardstock size. Printed in mass quantities, and increasing availability throughout the ridership area. Involved planners in the output of their mapping files to be used for further design. 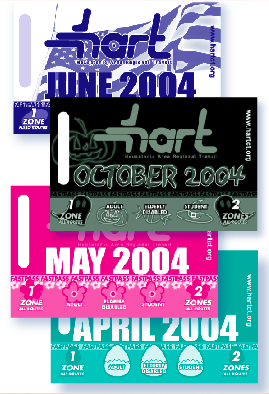 Monthly passes depicting seasonal celebrations. Increasing collectability and increasing sales.